They are true lock makers who manufacture and control quality for every aspect of every lock, from start to finish. Their emphasis on research and development ensures you of the most advanced technology and materials. Headquarted in Tokyo, Japan, MIWA is a family-owned company comprised of 1,562 employees who are dedicated to your security needs. The ALV2 P Series is the latest in Miwa’s long line of electronic locking solutions, it is designed specifically for today’s busy hospitality and multi housing industry. Available in several finishes and handle types. Slim is the sleekest model in MIWA’s electronic locking line- up. This lock is also popular among all hospitality and multi-housing industries. Available in several finishes and handle types. Cylindrical Lock The ALV2-C RFID cylindrical lock is the perfect solution for those applications requiring locks other than Mortise. Perfect fit and ease of installation along with the convenience of RFID for card access and management. 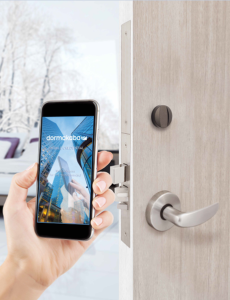 Dormakaba electronic hotel locks personify an unwavering commitment to deliver innovative solutions designed expressly for the lodging market. All their RFID locks are mobile access compatible allowing guests to access their room using a keycard or mobile device. Smart room automation is another key benefit realized with RFID contactless technology. Hotels seeking to accentuate guest convenience while improving operational efficiency choose dormakaba for exceptional features, outstanding value and peerless quality. The Quantum Series offers a unique and award-winning two-piece modular design with either magstripe or RFID card reader for a sleek look and superior lock performance. The lock is ease to use and works with the Windows-based System 6000™, Messenger LENS™ online wireless system and DeskLinc™ front desk system. The Saflok MT Series is a full-body electronic lock that offers either magstripe or RFID card reader technology to enhance guest convenience and improve operational efficiency. Ideal for retrofits, this lock works with the Windows-based System 6000™, Messenger LENS™ online wireless system and DeskLinc™ front desk system. The RT RFID is a rugged full-body electronic lock that offers contactless technology to enhance guest convenience and improve operational efficiency. This durable lock is easy to use and works with the Windows- based System 6000™, Messenger™ online wireless system and DeskLinc™ front desk system. Saffire LX features sophisticated RFID technology in a contemporary, understated design. Its high performance represents a secure, flexible solution bringing online capabilities and convenience to satisfy the technology needs of hotel properties, while optimizing the guest experience. The Quantum Pixel provides an easy-to use, secure, and flexible solution that is both visually attractive and high-performing. With its electronics concealed within the door, the Quantum Pixel’s visible hardware is minimal resulting in a lock design that integrates seamlessly with any hotel decor.